The report further points out that gas cuts carbon emissions, when it displaces coal, or oil but does not do so were it to displace nuclear or renewables. There is a perception in the United States that because wind, solar and natural gas generation have grown over the past years while coal generation has contracted, renewables and natural gas are a tandem replacing coal. This is not as firm a proposition as it appears. A new report, originating in Belgium, makes the proposition look particularly suspect: Impact of the German nuclear phase-out on Europe's electricity generation - A Comprehensive Study. Skimming the illustrations I was struck by a graphic demonstrating the exceptional peaking depth of lignite based generation (in the graphic, the solid colouring indicates the minimum output when generators are operating, with the shaded area presents the remaining capability - which I refer to as peaking depth). There are other factors at work in both the United States (low natural gas prices) and Europe (the market merit order and high gas prices) - but the idea that natural gas and renewables are characteristically ideal replacements for coal is highly suspect. Increasingly there is a recognition that renewables may be better matched with new coal-fired generation than any other generating source except for reservoir hydro (as Don Jones has been communicating for some time). The Centre for Climate and Energy Policy may see a role for natural gas so long as it doesn't displace nuclear and renewables, but that wish isn't impactful. Gas replacing coal reduces emissions by about the same amount as renewables replacing gas (as they did in Europe during 2012). 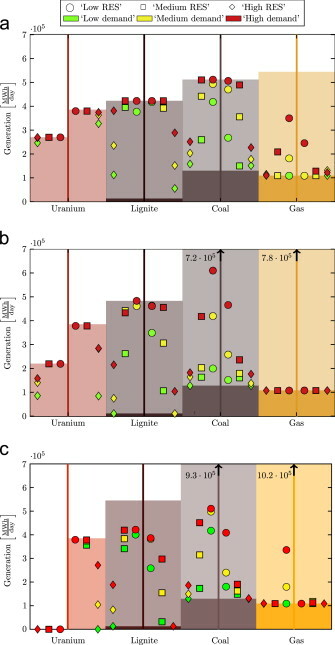 Renewables displace any baseload source, and replacing a baseload coal plant with a baseload nuclear plant results in greater reduction in emissions than the renewables/gas strategy.